Clarence B. Jones, Martin Luther King Jr.’s lawyer and occasional speechwriter, describes how he smuggled the letter out of jail. Andrew Young, King’s chief strategist with the Southern Christian Leadership Conference, and others who were close to King recall the moment they heard of his assassination. 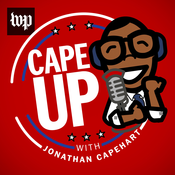 Starting April 4, ‘Cape Up’ will be presenting a special series highlighting the voices of civil rights leaders. Some you know and some you may not. For the next two months, we’re going to hear their voices. Listen to their stories. And try to understand. Senate Minority Leader Charles Schumer (D-N.Y.) called me to his grand office in the U.S. Capitol to talk about “undoing the damage” of the Shelby v. Holder decision, instituting automatic registration and granting statehood to the District of Columbia.